To an Indian Christian friend who asked about experiencing blankness and spontaneous bodily movements in meditation. I am very happy that you are meditating regularly. This is so very important. It is also good that you are meditating longer. It does happen sometimes that the meditator gets into a kind of blank or tamasic state in meditation, and may even pass into dreamless sleep without realizing it. This is because the mind is used to going into the sleep state when the mind becomes still and relaxed. In time this problem goes away. But be sure you are getting enough sleep at night. Bodily movements and tremors do occur to some yogis in the beginning. When it happens, stand up for a few moments and then sit back down. Sometimes these things occur because the meditator has habitually been living with some muscles tensed, and now they are beginning to relax and cause such movements. It is good to take a deep breath and let out all tension occasionally. It is important to not let such movements take over, but stop them immediately. There are so many sources for these problems that it is impossible to determine them. Worship of God in Meditation or in Church: Which Is True? Q: In meditation, I feel myself OF God; in church, in the sacraments, I feel a “surrender” to God. Both are beautiful and in my mind, they are compatible energies, one feeding the other. But, I would welcome your thoughts on this matter in the event I am missing something or perhaps “confusing” energies. God is both within and without us in our present relative state. The oldest Upanishad, the Isha Upanishad begins: “All this, whatever moves in this moving world, is enveloped by God.” So when we look outward we experience God, and when we look inward we experience God. But the experiences are different. The inward look is to ourselves and our union with God. The outward look is to the wonder and glory of God in his relation to us as we are in the world. One produces a non-dual wonder, and the other a dual wonder. Our inmost consciousness recognizes God as our Self. Our outer, illumined consciousness embraces God in love and joy. This is the experience of all yogis. The theological word-worshippers may not agree, but what do they know? They only have words and the ego those words inflate. 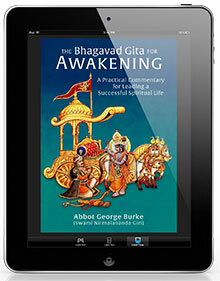 I am so happy for you that you are fulfilling and experiencing the essence of the Bhagavad Gita: “Be a yogi!” (6:46). Q: I am wondering about the concept of Paramatma, Prakriti and jivatma: Why have a construct of Paramatma, Prakriti and atma/jivatma? Why not simply have Paramatma, without the need for any existence, any Universe, creatures or beings, given that Paramatma is eternal, unmanifest, not of Prakriti, and does not require Prakriti or jivatma to “be,” whilst the latter two require Paramatmna to “be”… etc? I do understand that with this hypothesis, there would be no beings, universe etc. which is a false statement in itself, but from a Vedanta standpoint, what is the “tarka” or logical reasoning for the construct of Paramatma, Prakriti, and jivatma? You see yourself into what absurdity it all falls when a person subscribes to Advaita Vedanta rather than Sankhya, the original philosophy (darshana) of Sanatana Dharma, especially the Bhagavad Gita, and of the Yoga Darshana itself. When we realize that these three concepts are necessary for an intelligent pursuit of Brahmajnana and moksha, it is really an absurdity to deny their value.